As an artist of words, I’m accustomed to painting pictures with my keyboard, but a photographer must speak volumes with one click of a shutter. 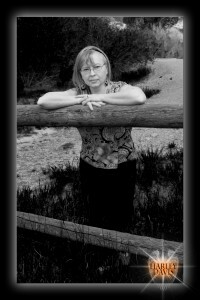 To that end, allow me to introduce my amazing photographer, David Kimball Davis, aka Harley Davis, an art photographer with an eye for detail and an inherent feel for setting a mood with a picture. Originally from the Lake Tahoe area, David has been involved in art in one way or another for most of his life, from graphite portraiture, to pastel chalk sketchings for a line of greeting cards which also included his original poetry, to caricature drawing and unique marketing logos. In recent years, he has focused his camera lens on the tiny details of product photography as well as on the quiet beauty of landscapes and architecture. His sports photography has won awards, and he is renowned in the fast-paced world of hot rod photography, where his custom photographs are sought by vintage car collectors. Clearly a versatile photographer, David has an uncanny way of bringing to light the subtle nuances of his subjects, revealing hidden shapes and shooting from unique angles that bring a greater appreciation of the ordinary and turn it into magnificent art. I once admired his black-and-white photo of an old barn in winter and wanted to see the real thing. When he showed it to me, I was astounded. It was on a road I’d traveled many times. The old barn had never caught my eye before. 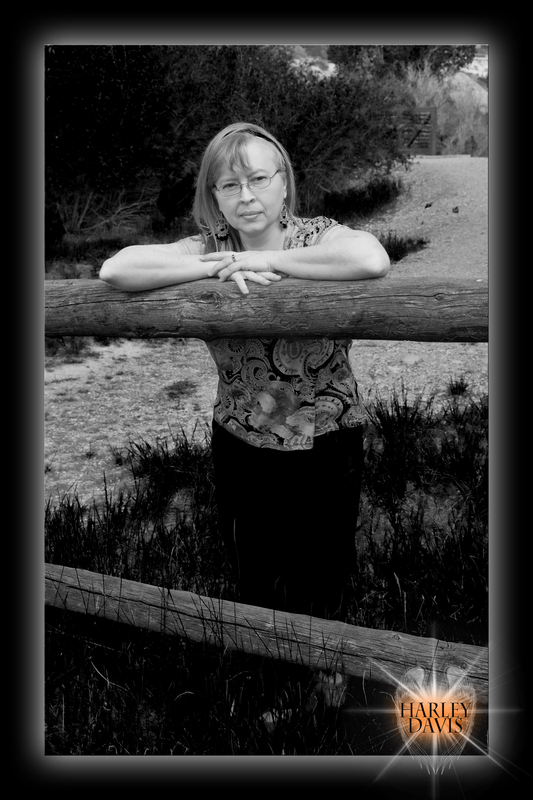 If you haven’t guessed by now, the photographer is also my husband, and I am fortunate that his art and my writing have been able to come together creatively on my website, including this recent portrait of me. I invite you to peruse some of his pictures here to enjoy his work far beyond what I am able to describe, because after all, a picture is worth a thousand words! Fun times with the Bountiful book club last night! First, I confess I’m directionally challenged, so the evening began with me calling the hostess for help. “Oh, I can find your house with no problem,” I assured her. “It’s Bountiful I can’t find.” The evening finally commenced with the arrival of the late Shelly Davis. We had a good discussion about Eagle Shadow with thoughtful questions and comments about the story and my experience in writing it. We touched on the topic of the research that goes into a historical novel and the many interesting ways an author can come across useful information, even when not actively looking for it. I was pleased to hear how long this book club has been active (about eight years). It was a great group; we laughed a lot; and I had one of the best times I’ve ever had as a book club guest. I’m also very excited that Eagle Shadow has gained some new fans and that they’re eager to read the sequel, Eagle Rising, as well, and some already have. Thank you, book club members and Tami George, for hosting a fabulous night. To continue yesterday’s report on classes at the 10th annual LDStorymakers Conference, I attended two good classes regarding the industry. In the class on small vs. Big 6 publishers, taught by bestselling authors James Dashner and J. Scott Savage, we learned that the often-feared phrase “right of first refusal” that is in nearly all contracts regarding future books the author will write, is not all bad. You don’t have to accept the deal they offer you on future books, if you don’t want to be tied to that publisher. However, it is always a good idea to have an attorney go over your contract before you sign, to be sure what you are getting into. Big 6 publishers have much more capability in their editing departments. All authors, no matter how experienced and successful they are, will receive many pages of edits and revisions to work on. And with much bigger promotion budgets, big publishers can do a lot more advertising for you. That doesn’t mean they will, just that they can if they so decide. Still, though, word-of-mouth is the very best advertising you can get, no matter who your publisher is. So yeah, that’s why you learn, practice, and work hard, so you can be the best you can be and earn that word-of-mouth advertising. And the presenters assured us, you can expect to be able to quit your day job, if that’s what you want, but it will take a long time, and you do not quit until you have to. Silver Pages to Silver Screen was taught by Bob Conder, who has over 30 years in the film industry. According to him, here’s what you need to make your book appealing to Hollywood: A great logline, great title, great characters, great dialogue, great concept, and a three-act structure. Every story should end where it begins (in situation, not necessarily location). Write visually because remember, movies are visual. You want the gatekeepers to be able to visualize it on the big screen. And here’s a good one I’ve always believed in—write for yourself first. If your heart is fully into the project, that’s going to show on the page. Thanks, LDStorymakers, for a good conference. I look forward to next year. I had an amazing time attending the 10th annual LDStorymakers Conference this year, wandering around amongst fellow writers, talking shop talk, and attending very well-put-together classes. And the icing on the cake was when I got The Maze Runner author James Dashner’s autograph for my son, who happens to be reading that book right now and was pretty thrilled to get that. Here’s a summary of the classes I attended. In this post, I will cover the ones having to do with the writer’s craft. In my next post I’ll address the book industry classes I attended. First was Scene & Sequel where we learned about reader contracts. That’s the contract we have with our readers to deliver what they are expecting from us. We dissected the parts which make up scenes, i.e., the goal, the conflict, and the disaster (which isn’t necessarily as violent as it sounds. It’s just the thing that goes wrong so that the main character in the scene doesn’t meet his goal.) Then we learned about the parts of the sequels. (The term ‘sequel’ confused me at first. The name I learned these by is ‘interludes’.) Whatever you prefer to call them, the parts are: the reaction (of the character to the disaster just experienced in the previous scene), thought, decision, and action, which leads the character into the next scene. The teacher talked about the pacing of novels being affected by the genre and the target audience, and how sometimes those scene and sequel parts can get put into a different order. Good information, but I couldn’t help but think we were splitting hairs a bit. Based on the examples given, I wondered if we were fitting the books to the plan or the plan to the books. My take is, get all the training and practice you can, then trust your subconscious. It knows what it’s doing! Indeed, one thing I heard repeated in several classes was breaking the rules can be a good thing, as long as you learn the rules first so you know how to break them properly. In Loud & Clear: Finding Your Voice, we learned that there are three things publishers look at: voice, writing, and plot, and depending on which genre you’re writing in, any one of those can come to the forefront. Some elements that make up your unique writing voice include character, the narrator, point of view, monologue & dialogue, and description. In Coloring Outside the Lines (basically a class about the aforementioned rule-breaking), we talked about genre bending. One thing that stood out to me was the advice that, if someone is shopping in a particular section of the bookstore that is their favorite, and they find your book in it and buy it, would they be disappointed because it wasn’t really the kind of book they usually buy? In the Point of View class, we discussed that, it isn’t just a matter of deciding between first and third person point of view. In third person alone, there are many options, omniscient, multiple, distant, and close, with close being pretty interchangeable with first person as far as how deeply you penetrate the character’s mind. Great stuff there! I had the privilege yesterday of acting as one of the judges at the local junior high school’s poetry recitation competition. This was a precursor to a state- and national-level competition called Poetry Out Loud. I had not heard of it before, but it was a very impressive thing. The students had chosen poems from an approved list, memorized them, and had to recite them before the student body. They are judged on accuracy, with a deduction for even one word being incorrect, level of difficulty, physical presence, voice & articulation, and dramatic appropriateness. The students had obviously worked very hard, and all gave great performances. And of course, I love that they got to study poetry so in-depth. Good job, Diamond Fork Junior High students, and congratulations to the winners. Well, this is taxing. Let me know if you think of anything before I tell them Oreos! 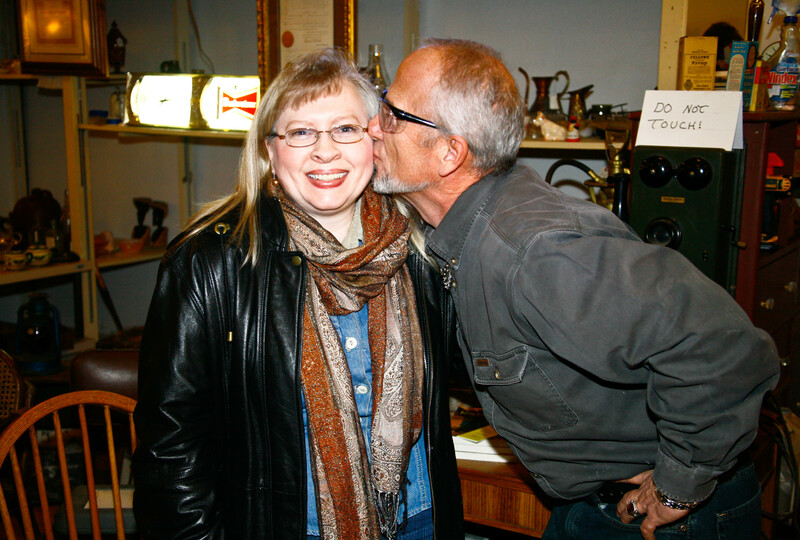 Here are a couple more photos from the First Friday book signing at Iron Horse Antiques. Thanks to Diana Root from the Sun Advocate in Price, Utah. Me with a fan. Hope she likes the book! Another fan gettin’ familiar. Hey, the sign says “Do not touch”! 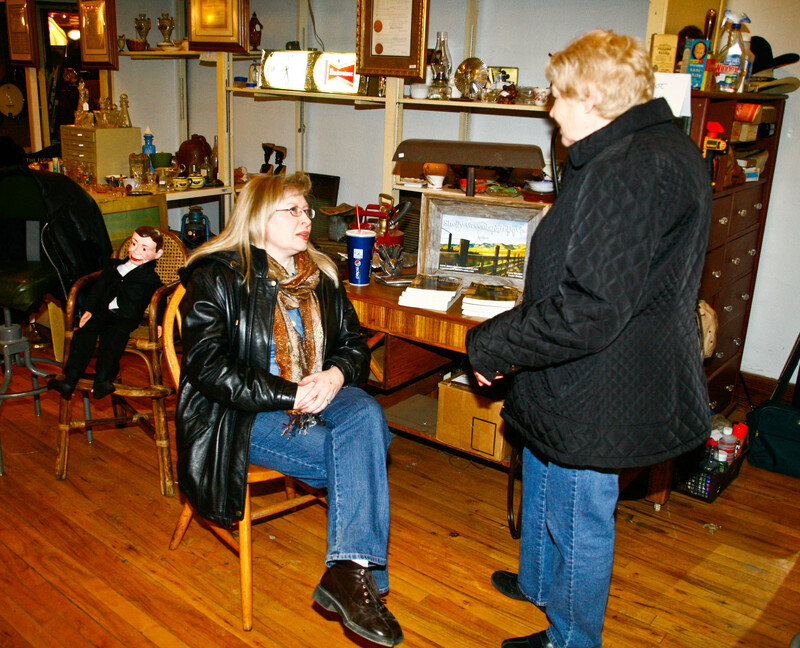 First Fridays in Helper, Utah are quite the event, and February 1 did not disappoint. 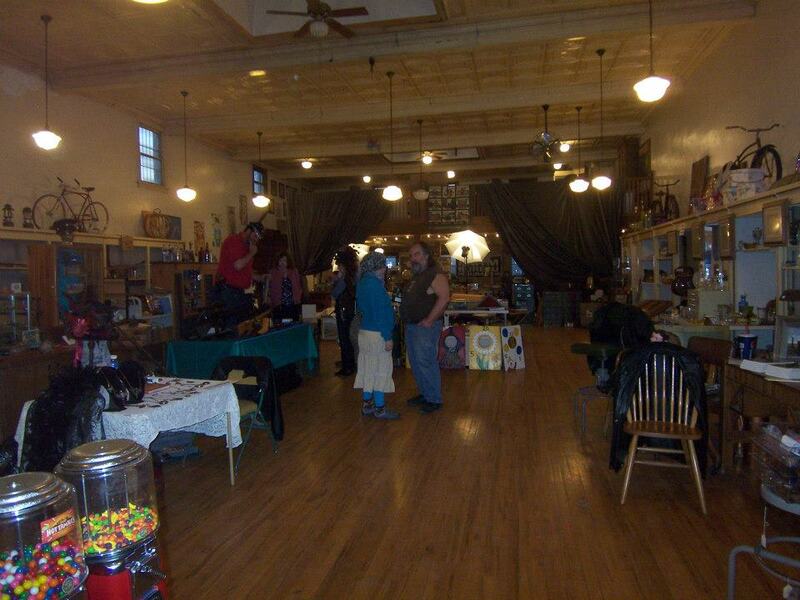 I was among several exhibitors at the Iron Horse and we had some good crowds. 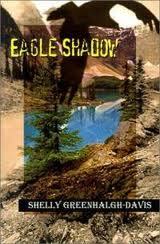 Eagle Shadow was a best seller that night! 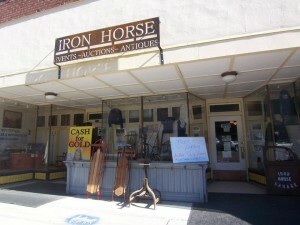 Exterior of Iron Horse Antiques. They host antique auctions, jam sessions, and many other awesome events. Interior of the Iron Horse. This is the old J.C. Penney building in Helper. 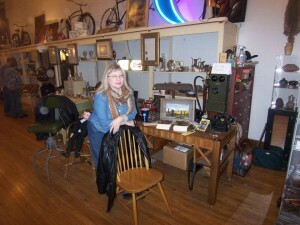 Me at my book signing table. Thanks, Iron Horse. Let’s do it again soon! Come one, come all! I will be doing a book signing Friday, February 1, at 7:00 p.m. at Iron Horse Antiques in Helper, Utah. This will be part of the monthly First Friday events in Helper during which the shops stay open late and many activities are going on. Iron Horse Antiques, at 115 S. Main Street, is an eclectic shop filled with Western memorabilia from the 19th and 20th centuries, among many other interesting and unique items. It is a perfect setting for an Eagle Shadow book signing, and I thank them for their invitation. Thank you to the Somerset Book Club in Spanish Fork, Utah, for featuring my book Eagle Shadow for this month’s reading and for hosting me Thursday evening. I had a wonderful time visiting with them. They noticed how my eyes lit up when talking about my characters, and you know, it’s true. I love talking about my characters as if they are real people. That’s the reason we authors do what we do. We create worlds that are so real to us that we simply must bring others along and show it to them too. I love these kind of informal book club visits because I like to let the conversation lead in whatever direction the readers want to go, and it’s always fun to see where that will be. We ended up talking a lot about the research needed for an Old West novel, and I got to reminisce about some of the very unusual ways I learned things to include in my book. The club members also picked up on the nuances of the characters in Eagle Shadow, just as I hoped they would. I felt like they were on board with me all the way. And an extra bonus. 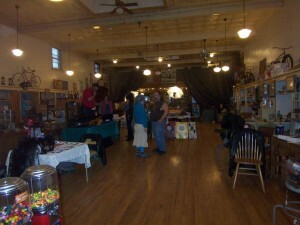 It turned out many club members are also writers, so there was some great shop talk going on, and I made some new friends. Thanks, Somerset Book Club, and to Angela Ingo for arranging the meeting!